When Hurricane Maria decided to lay her wrath on Puerto Rico, she had no idea that her winds would lay bare the cruel face of both American capitalism and American imperialism. Though far away in the Caribbean, Puerto Rico’s history is closely linked to the Latino experience in America, for we are all the children of empire, especially in L.A., which is a city marked by the imperial acquisition of Mexico in the 19th century. As Trump bullies Puerto Rico, so the system has treated its Spanish-tongued subjects everywhere. “Imperialism” is a dirty word in the halls of American political discourse, whether Republican or Democrat, because the Norman Rockwell view many cling to cringes at the idea that we are (gasp!) an empire. Our countless bases overseas, our base in Guantanamo, Cuba, our continuing presence in Afghanistan, Iraq and parts of Syria are all driven by the hand of manifest destiny according to the cultural daydream. We refuse to believe we are children of she-wolves like the Romans, or warlord Mongols seeking plunder, or even top hat-sporting Englishmen strolling through India with pompous umbrellas. But President Trump’s response to Maria’s devastation of Puerto Rico was pure, predatory imperialism. Aside from visiting the island and making astoundingly clueless remarks—such as comparing the Maria death toll to Hurricane Katrina, Trump is now quietly using the Puerto Rico tragedy to reap a profit. But first a little detour into the past. In 1898, the Caribbean was gripped by revolutionary furor as islands such as Cuba sought independence from the Spanish crown. A bit of fake news helped give the U.S. an excuse to step when the U.S. battleship Maine blew up near Havana. The explosion was blamed on Spanish mines—which historians now agree was false—and so Uncle Sam rode on into Cuba and other Spanish-held territories. When the dust settled, Cuba was an “independent” client state while the Philippines, Guam (that little territory now threatened by Kim Jong-un) and yes, Puerto Rico, officially became U.S. territories. Essentially from 1898 to 1947, Washington decided who the island’s governor was. The island was allowed an elected House of Delegates, but with little power. 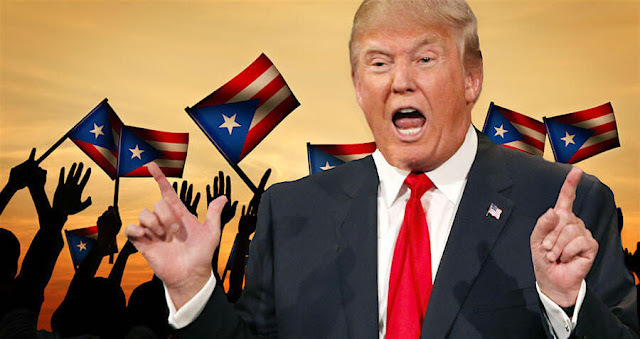 In 1914 the House voted for independence, Washington declared the vote “unconstitutional.” In 1917 it was decided that Puerto Ricans could officially become U.S. citizens, a move which at the time was seen as a slick ploy by President Woodrow Wilson to recruit more cannon fodder for the inferno of World War I.
Puerto Ricans were at least spared the brutality of the U.S. occupation of Haiti in 1915, when resistance leaders were nailed to wooden frames like black Spartacuses. Cuba, of course, liberated itself from U.S. dominance with the 1959 Revolution, only to face embargoes, sabotage and threats of invasion. Who remembers that U.S. Marines invaded the Dominican Republic in 1965 to stop a popular revolt? Puerto Rico, not be outdone, has produced its own slate of celebrated resistance fighters. Prominent among them in the 1950s was Pedro Albizu Campos, who believed in armed rebellion for independence: he was promptly imprisoned and ultimately released shortly before his death from illness in 1965. There is hard evidence the U.S. government experimented on the man with radiation during the time he was held captive as a political prisoner. Today Puerto Rico has a 45% poverty rate and a disastrous debt running at $72 billion. Hit by a historic natural disaster, our tanned president’s response has been to wag his finger at the island’s governor and complain that the island expects everything to be done for it. Heaven forbid the empire’s subjects demand some aid when struck by storms probably fueled by the kind of environmental policies the emperor and his clique support. In a brutally cynical move on October 10, Trump allowed the island’s waiver on the Jones Act to expire without renewal. The Jones Act of 1920 was passed to stimulate the American shipping industry and restricts shipments of any kind to only U.S.-built ships. A special waiver had been in place for Puerto Rico since the act was signed to ensure the island could afford the purchase of imported necessities. Now Puerto Rico will have to pay even higher tariffs to accept goods from foreign ships, making it harder to receive supplies and needed essentials for the population. This of course will produce a big boon in earnings for Trump’s friends in the country’s shipping industry, much to the detriment of Puerto Ricans. As of this writing only 15 percent of the island has power, 23 percent of grocery stores are closed as well as 22 percent of gas stations. Meanwhile 4,681 miles of road are closed in an island nation of 5,073 miles. But like the barrios of the republic stretching from California to Texas to Chicago, this is the way the major powers always treat their subjects- in particular immigrant communities. As gentrification encroaches upon neighborhoods which have sheltered generations and seen hardscrabble families thrive by engaging in local commerce, Washington’s big business policies now prepare to loot one of its own colonies. This is no different from when the French imposed a debt on Haiti as punishment for liberating itself from French colonialism, but remember that we, too, invaded Haiti as recently as 2004 to oust a popular government. History is a scorned lover that does not let you forget, as much as you refuse to answer the phone. The plight of Puerto Rico should be seen as part of a wider, colonial history. The White House is attempting to spin its own, feel-good propaganda campaign, producing videos supposedly demonstrating the already full recovery of the island, thanks of course to the guiding hand of El Presidente. But the mayor of San Juan, Carmen Yulin Cruz, a recent punching bag of the president’s, reports that power went out in hospitals and the government did nothing, and the latest figures show that tens of thousands of Puerto Ricans plan to leave the island for the glistening shores of their overlords of more than a century. There is a shadow here of the situation in Mexico and Central America, where U.S. policies are fueling the mass migration of people affected by the Drug War and other unsavory aspects of our inspired foreign policies. ICE stalk communities and Dreamers are being slowly shut out of the education system and workforce, obligated to return to life in the shadows of the only home they know. But Puerto Rico is a reminder that none of this is new; it’s just louder and uglier under Trump. There are profits are to be made, gentrification will march on, the colonies will be shunned and soon those seeking opportunity might have no choice but to go risk their lives on Iranian or North Korean shores.